Heat the broth in a pot over medium heat until it simmers. Turn off the heat and add the saffron threads, crumbling as you add them to the stock. Set aside to steep. 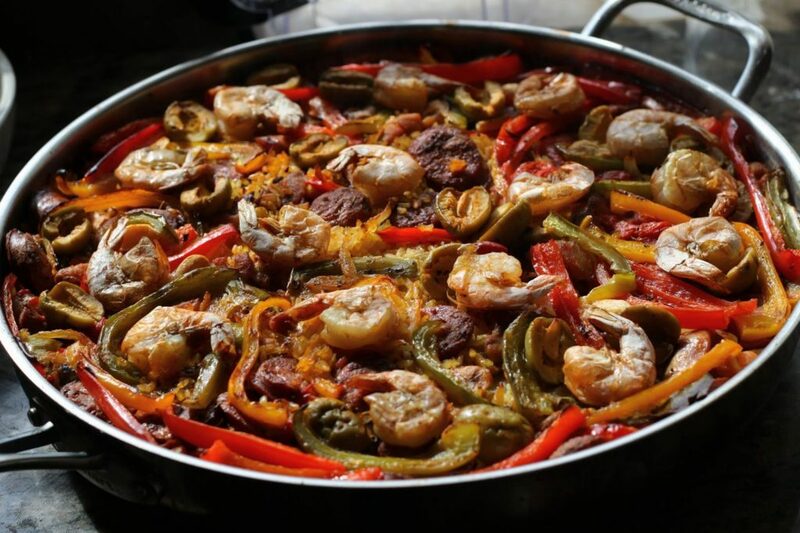 In a 16″ paella pan or equally large, shallow, heavy duty oven-proof skillet, heat 2 tablespoons of oil and sauté peppers and onions until translucent. Remove the vegetables with a slotted spoon and set aside. In the same pan, sauté the chorizo for about 5 minutes. Season the chicken with salt, pepper, and smoked paprika. Add the chicken to the sausage and cook until just barely golden brown, remove and set aside. Add 2 more tablespoons of olive oil to the same pan. Add the rice and cook over medium heat for about 5 minutes, stirring frequently until it begins to toast scraping any browned bits from the bottom of the pan so it doesn’t burn. To the pan with the toasted rice add the tomato, thyme, garlic and chili flakes and cook down, stirring until almost a paste consistency, about 15 minutes, scraping the bottom so that the contents don’t burn. Add the chorizo, chicken, cooked vegetables, and olives over the top of the rice. Add the broth, stir once, and then no more stirring from this point on. Bring to a simmer on the stove top for 10 minutes. Cover with foil and cook in the oven for 10 minutes longer. Remove the foil and allow the top of the paella to become golden, approximately another 5 minutes. Remove for oven and allow to rest for 10 minutes covered. Serve with lemon wedges.